Here a simple guide on how to defeat the Crusader stages in the thrilling action RPG multiplayer online battle arena (MOBA) game - Heroes Charge. This will show players some strategies to sweep all 15/15 stages in Crusade Mode, using early game Heroes and some recommended Heroes to help you out. - Any front line hero you have with decent HP pool, the more tank heroes you have, the better, but if you have Death Knight, he alone should be enough. - Example early game heroes: Admiral, Cleric, Brute, Shallows Keeper, and Savage One. - Upgrade and level them up even if you were able to get better front line Heroes from other sources. Do not focus on just 1 front line Hero, like I said,the more tank heroes you have, the better! - Hiring a Mercenary: Death Knight! - I highly recommend hiring Death Knight because of his magical shield that can absorb damages and turning it into HP! - Do this option once you run out of tanks. Death Knight can heal himself by using his Ulti, if he needs more HP, use Chaplain's Ulti. Try to keep your Tanks alive. - If your guild doesn't have a Death Knight that you can hire, then you'll have to rely for now on your current tanks plus the Hero that you can hire, then reach what you can. Check the stats of the mercenaries at your guild before hiring them, a nicely upgraded Hero is what you want. - There are more Heroes that you can hire with nice skills too like the common early tanks Brute and Lightning Elemental, War Chief which is great after purple, or even Death Mage! - Experiment and discover more ways. - Also known as damage dealers (DPS = Damage per Second or Strike). - Any DPS heroes you have, probably these three: Shadowleaf, Lightning Master and Emberstar. If you were able to summon Wind Master, Succubus, Death Mage (best), Lightning Elemental, Phoenix, or any Hero that can dish massive damages, then replace according to your preference. - Also a must have Hero because of her nice team support buffs and damages. If you don't have her yet, replace her with another DPS Hero here for now. - Once you get her, use some EXP potions to boost her up, then max all of her skills! - Note: Redeem your Crusade/Dragon Points to get Commando asap! - Chaplain: Yup this is where I'll place Chaplain, a great Hero for Crusades because of his massive team Heals, make sure to max his Kindred skill all the time. - Commando: If you are confident enough that you don't need Chaplain at the moment, then it's ok to switch Commando here. - Control Heroes that are great overall: Old Curse and Vengeance Spirit. 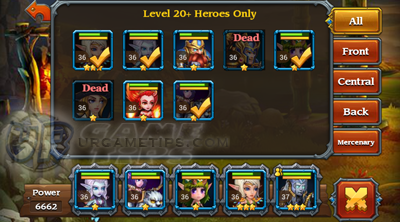 - As much as possible, keep your 5 core Heroes' levels even to each other. - I suggest you promote most of your Heroes to Blue first. - Farm and equip all available Gears that you can get from your currently unlocked Stages, if you have them all, slowly unlock more Stages in Campaign Mode to get the next set of Gears. Focus on your Core team then the others. - Gears with Hp and Energy Regen are also good, because they will still activate after every battle, pretty useful to sustain Energy before the next battle, especially for Chaplain. 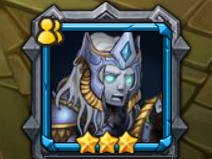 - Most of your Coins should be invested on upgrading important skills of your Heroes, upgrade whenever you can. Do not let the gap between your Skill Lvls and your Hero Lvl to widen, or else you'll be having a hard time vs well upgraded teams with the same avg Lvl with yours. Unlock or Summon More Heroes! - Believe me, just continue playing the game and new Heroes will pour in from unexpected sources, like from free Chests, Events, Rewards or other Freebies, and more. - The reason why you need more Heroes is because some Crusade Stages ("if you are unlucky"), especially at higher levels, are insanely hard to complete because of the Lvl gap, so you'll need more Heroes other than your core 5 team. The more useful heroes you have, the better. - This should be done at least after "Purple". Enchant stats that are important to your Heroes, especially weapons, or any items that can help you regenerate more Energy. - Enchant after Promotion, not before. - Just Evolve Heroes that you can while progressing through the game. - Some Guild will require you to apply, but others will let you instantly join them. - Join a guild with a good number of players, if you can't find any "open to all" Guild, go to the World Chat then find Guild IDs there. Enter the ID using the Search option under Guild feature. - Most probably, you might want to hire a Front line Hero, Death Knight is highly recommended early to mid game because of his Ulti, well if your guild has him though, and make sure the Lvl of DK isn't above your current Team Lvl to hire. - Death Mage is one of the best heroes for Crusades mid to late game, hire her if you can. - Hitting your opponents will also let them regenerate Energy, so if you fired most of your AoE but most of them are still alive, expect Ultis to come at you. To prevent this, use stun, silence, or knock back to interrupt their skills, time it well. Killing them before they do will also do the trick. - For the first few stages, fill up your Heroes' Energy bars. Swap Heroes with full Energy to let the others ready their Ultis too. - Do not use Ultis, if there is only 1 enemy Hero left (unless you want to heal), save them for the next stage and use that remaining Hero to pump up your Energy bars. Preserving Energy is the key here, so try to keep your Energies high. - Try to kill multiple enemies with your Ultis to instantly regenerate Energy. - If one of your heroes dies during battle, hit the pause button then "Retreat" to exit the battle and lose nothing! Refer to the link below for recommended heroes for Normal and Crusade runs. - Don't hesitate to increase your Team Lvl, actually I highly recommend that you boost your Team Lvl so that you can hire Heroes with higher Lvl than the avg Lvl of your team. - This idea will give you a lot of advantages especially if you can increase the gap more between your top 5 Heroes average Lvl and your Team Lvl. Yup, I strongly believe (based from experience and experiments) that the game will randomly choose your Crusader opponents based on the Average Lvl and Total Power of your Top 5 Heroes, with 90% chance that your opponent's avg Lvl will not go above your top 5 Heroes' avg Lvl, this is common for Crusade runs especially at early Lvl 32 to 40ish, but once you reach higher levels, it's different. - Example: From the starting stages (1/15 to 10/15) of Crusade, your opponent's avg Lvl is below your top 5 Heroes' avg Lvl, but once you enter 11/15 and above, their avg Lvls and even Total Power will start to spike up!, forcing us to play multiple Teams at some point. 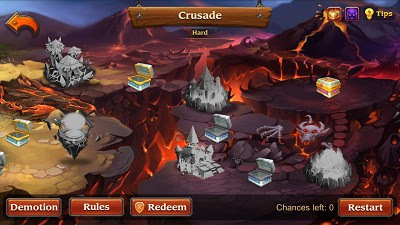 - Yes, at some point while sweeping Crusade, the difficulty will suddenly rise up, even around 7/15. - Note that the above examples might change in the future because Crusade difficulty will also depend on the developers of the game. Sometimes they will make it easier (reduces the number of stages that enemy team's avg Lvl is higher), but if they think it's too easy, they will make it harder (11/15 to 15/15). - Here's a sample change-log to prove Devs have something to do with the difficulty. - teams that has less than 5 Heroes, but avg Lvl is still lower than yours. - teams with high Lvl Heroes but accompanied by low Lvl ones. - teams similar to yours, oh wait that's you! Lol ~ Yes, it is possible to battle your own Arena team setup. - Note that Arena Rankings doesn't have any effect on Crusade difficulty though, especially for high Lvl players. 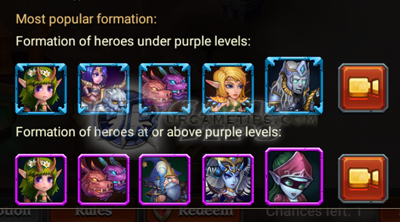 - Focus more on increasing your Team Lvl, but purposely under level your Heroes. - Example: Your Team Lvl now is 42, and your Top 5 Heroes have an avg Lvl of 27. If you enter Crusade, the game will generate a team with an avg Hero Lvl of around 26 and below, and 35 and below at 11/15 to 15/15. 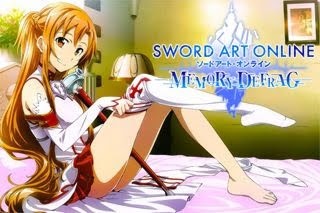 - Next, just hire a nice Lvl 42 Hero to help you easily sweep all Crusade stages ~ LOL! - I even saw someone who just hired and used one Lvl 42 Death Mage Hero to sweep all Crusade stages (1 vs 5), using this strategy ~ XD! - Anyway, if you play a lot, this will not be the case because it is most likely that your Top 5 Heroes' avg Lvl is somewhat close to your Team Lvl, so the chances of you winning, depends on your overall number and quality of Heroes, team build, Power, and your wisely picked Mercenary. - Just try to give a gap to gain some advantage, the more, the better. - Result = Doesn't affect Crusade difficulty!. - It does have a little impact maybe because the range of low Lvls is wide, thus the game has a higher chance to select weaker or stronger opponents based from your rank position. - All opponents' avg Hero Lvl is still lower than me though, the only difference is their difficulty or let's say Total Power. - Example: The range of Lvl 30 to 35 (avg top 5 heroes) is around ranks 10,000 ~ 40,000 including you. If you boost your Arena rank above 10,000, it is most likely that your Crusade opponents will get stronger because the game will select your opponents from around near 10,000, where teams are better in terms of Total Power but still have lower avg Lvl than yours. - This might also be the reason why some players experience easier Crusade opponents after lowering their Arena Ranks, because the game will target and choose opponents from around near the 40,000 rank (example above). - Doesn't matter because even if you lower your rank to 100,000, the game will still select opponents from your range (based from your avg Lvl of top 5 Heroes). At higher Lvls the range of high Lvls is small, so it is possible that you will encounter the same teams per day, or even your own team!